Google announced the new thinner, powerful, faster and portable Nexus 7. This second-generation tablet packs a more powerful processor, razor sharp full-HD screen, impressive speakers with above average battery life. Let’s read about its features in detail. Slimming down – This new Nexus 7 have sleek and classic black body which gives it a professional look. The matte black back is soft to touch and much nicer to hold than some other glossy, plastic backs. The back is slightly slimmer as well as slightly lighter than the last model. Google opted for mismatched bezel, that makes the screen look smaller, and the tablet looks asymmetrical. The Nexus 7’s 16:10 aspect ratio already makes it look gangly and tall. A micro USB port is provided at the bottom for charging and syncing purposes, while the volume and power controls sit on the tapered right edge. The two 5-megapixel rear shooter cameras allow taking decent, accurate photos, although the front lens is really hard to align with your face it works just fine. For me, a good display is the most important feature of a tablet. Thanks to new Nexus 7, for its 7.02-inch, 1920 x 1200 IPS display that makes books and movies look awesome. It has bright, vivid colors without being over saturated; the viewing angles are ridiculous; and text, photos, and 1080p Netflix looks incredible. A new set of speakers which are both louder and output genuine stereo sound makes the Nexus 7 the best small tablet ever. 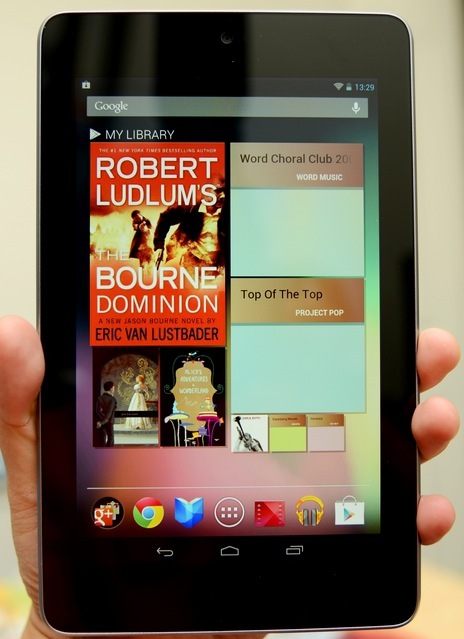 Last year’s Nexus 7 came with Android 4.1, a massive improvement in the operating system called Jelly Bean. With the new tablet comes a new version of the OS, Android 4.3. This new version OS now supports Bluetooth LE and OpenGL ES 3.0, which promises improved graphics and controlling of apps and settings for particular user accounts. I can’t say for sure how much of a performance improvement Android 4.3 is. There are still some noticeable problems — that Google still can’t figure out. Its battery life is really solid. I used it non-stop for an entire day and only about 75 percent of the battery, so with regular use getting a few days out of a charge shouldn’t be hard. Even at $229 (with 16GB of internal storage) a yearly upgrade is a tough sell; but when you’re spending $269 for the 32GB model or $349 for 32GB and LTE service, you should expect more than six months of top-notch performance before it starts to sputter. The Nexus 7’s a powerful machine have foreseeable future. Share your valuable comments and views with us.